We are working on information for Monday’s COW meeting…our focus will be to share a matrix that explains what the adopted plan schedule envisioned and where we are at to date…we have made great strides and I/we need to ensure that further implementation is sustainable…this is a foundational principle that we take very seriously. For clarification, Tony has been doing his job and continuing to recommend further implementation, I am the one who declined his requests due to long-term sustainability…no longer can we look at such significant service enhancements in a one year window. 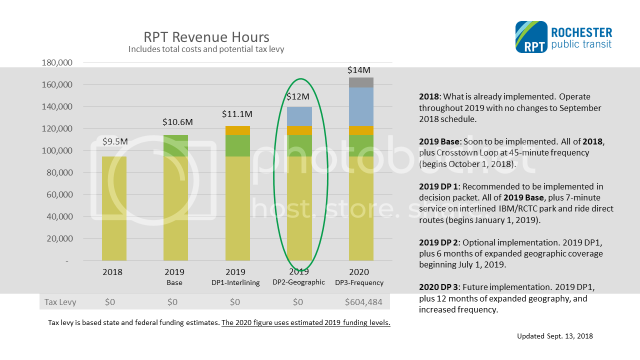 I do want to say the adopted plan’s funding strategy was just that; a strategy that had a heavy (and I would say unrealistic) reliance on tax levy for capital needs…this would have only been possible if the Council significantly reduced tax levy for other capital or operating priorities. In saying all of this, we received some very positive news from the State since Monday’s COW…we were informed that the State will provide additional funds eliminating the need for tax levy to further expand service…if the Council is inclined, you can now move forward with geographic expansion (green circle bar) without the need for any tax levy support…this would be implemented on 7/1/19 for two primary reasons 1) we need additional drivers hired and 2) we need to engage the neighborhoods who would begin having bus services. Last, I still strongly recommend against full implementation because that would require an estimated $600k in tax levy, we may need additional buses, and it seems prudent to allow the new service enhancements time so we can evaluate ridership in the geographic coverage areas before adding additional service.